Founder/CEO Leslie Magsalay-Zeller grows Pooki’s Mahi® coffee subscriptions revenue by implementing stricter supply chain processes in early 2018; product requirements like California Prop 65 Warning, nutrition, expiration, and intellectual property protection are prominently visible to customers. 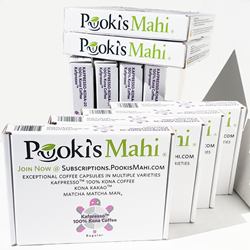 Pooki’s Mahi® grows coffee subscriptions revenue with stricter supply chain management. I audit Pooki’s Mahi supply chain performance, improve processes, and immediately replace under-performing firms. Komo Kitty℠ Project is a multi-year effort to build a technical platform supporting existing supply chain, overhaul operations, protect brands, and expand go-to-market activities. Silicon Valley startup Pooki’s Mahi® announced today Founder/CEO Leslie Magsalay-Zeller grew luxe coffee subscription revenue by implementing stricter supply chain processes in early 2019; product requirements like California Prop 65 Warning, nutrition, expiration, and intellectual property protection are prominently visible to customers. “I audit Pooki’s Mahi supply chain performance, improve processes, and immediately replace under-performing firms. Firms lacking systems architecture expertise or public APIs will never meet Pooki’s Mahi technology and supply chain requirements. Pooki’s Mahi executives have a strong technical background, and built integrations between Pooki’s Mahi platforms managing sales, inventory, and product catalog for large retailers using cloud-based technologies,” continues the Silicon Valley executive. Pooki’s Mahi is a technology company that follows strict supply chain management processes to improve existing products and platform. How Pooki’s Mahi manages product life cycle management is inspired by Founder/CEO Leslie Magsalay-Zeller time at Fortune 500 companies leading large product launch teams. The Silicon Valley technology executive created Pooki’s Mahi supply chain management with transparency in mind. The repeat customers appreciate Pooki's Mahi efforts for providing all the product information. The State of California approved California's Proposition 65 product labeling requirements in late April 2018. Founder/CEO Leslie Magsalay-Zeller designed California Prop 65 label requirements in early 2018 with a target to launch the new product labels immediately after a decision was made. Pooki’s Mahi shipped the new product labels in the 100% Kona coffee pods, and new product launched in May 2018. Nutrition information, California Prop 65 and product information are designed onto the packaging label for all Pooki’s Mahi 100% Kona coffee pods, Kona KaKao™, Matcha Matcha Man®, Koffee KaKao™, Kona Kafpresso™, and Kafpresso™ coffee capsules. The State of California requires firms with 10 or more employees selling a coffee product to anyone in California to provide warnings of exposures to listed chemicals in the products. California contains more than 900 chemicals known to cause cancer, birth defects and/or reproductive harm. Product labels should have a warning regarding the exposure unless the firm qualifies for a specific exemption. The list includes many chemicals that are found in conventional household cleaners, foods, drugs, etc. California requires a warning label must be provided for coffee products sold online like through a marketplace such as Amazon or Walmart and catalogs. Actions for violating California Prop 65 may be brought against a manufacturer, producer, importer, supplier, distributor, or retailer buy government officials or by private individuals. The penalty for a violation can be up to 2500 per day per violation. Pooki’s Mahi Founder/CEO Leslie Magsalay-Zeller found competitors coffee products sold through grocery stores and marketplaces are missing California Prop 65 Warning label. Pooki’s Mahi owns product merchandising, product management and fulfillment for foodservice customers and marketplaces. Fulfillment for Pooki’s Mahi 100% Kona coffee pods is handled out of their California headquarters or operations facilities. Certificate of Insurance is required to resell Pooki’s Mahi 100% Kona coffee products. Affiliate marketers, bloggers, brokers, and distributors are not approved resellers. Affiliate marketers fabricate information about Pooki’s Mahi 100% Kona coffee pods, lack Certificate of Insurance, and are not responsible for customer service. Bloggers publish incorrect Pooki’s Mahi Kona coffee content, lack IP attribution, fabricate inaccurate information, and refuse to handle questions from customers. Pooki’s Mahi Founder/CEO Leslie Magsalay-Zeller immediately implemented CA Prop 65 label requirements. Packaging for Pooki’s Mahi 100% Kona coffee pods, 100% Koffee KaKao™ coffee pods, Kona Kafpresso™, and Kafpresso™ coffee capsules have the new product labels. Customers living outside of California were unaware of the new label requirements and shocked to Pooki’s Mahi quick to adapt. California customers were delighted to Pooki’s Mahi speed to adjust and implement the product label changes. Pooki’s Mahi uses a Just-In-Time (JIT) supply chain process to manufacture 100% Kona coffee pods, and Kafpresso capsules. The JIT manufacturing process ensures Pooki’s Mahi coffee subscribers, and VIP customers receive fresh roasted KrakaMoka espresso from green coffee beans. Pooki’s Mahi JIT supply chain management enables the Silicon Valley technology company to implement the State of California Prop 65 label requirements quickly. Packaging for 100% Kona coffee pods, Kona KaKao™ coffee pods, Kafpresso™, and Kona Kafpresso™ coffee capsules have CA Prop 65 Warning label. CA Prop 65 Warning label is found next to the nutrition information, IP protection, and Pooki’s Mahi product information on the outside packaging and on each wrapper protecting 100% Kona coffee pods. Authentic 100% Kona coffee pods are sold and fulfilled by Pooki’s Mahi on marketplaces, food service, and international grocery retailers. Certificate of Insurance required to resell Pooki’s Mahi® 100% Kona coffee pods, Kafpresso™, Matcha Matcha Man®, Kona KaKao™, Kona Kafpresso™, etc. Two days to fulfill orders; customers will receive Pooki’s Mahi 100% Kona coffee pods within seven business days. The Silicon Valley-based food and beverage brand has grown without a loan or venture funding. Pooki’s Mahi Founder/CEO takes a high tech approach to develop and launch new product launches. The technology executive continues to build and improve architecture to support existing ecommerce platforms. Founder/CEO Leslie Magsalay-Zeller designs Pooki’s Mahi® product lines and continues to update technology platforms supporting multiple channels. The Silicon Valley startup is focused on manufacturing expensive 100% single origin specialty coffee under its Kona KaKao™, Kafpresso, and Kona Kafpresso brands; as well as Matcha Matcha Man® tea pods. 100% Kona coffee for Keurig 1.0 and 2.0 single serve coffee makers. Pooki's Mahi®, Matcha Matcha Man® are registered trademarks of Pooki’s Mahi. The PMO Practice™, Kona KaKao™, Koffee KaKao KaKao™, Kona Kafpresso™, and Kafpresso™ are trademarks of Pooki’s Mahi. New Product Launch Introductions, Go To Market Planning, and supply chain frameworks are protected under VA 1-924-170. Pooki’s Mahi® is a Silicon Valley-based technology company passionate about combining technology, operations, and digital marketing to consistently launch the best Kona coffee pods, new private label Hawaii Kona coffee Nespresso capsules and custom tea capsules to market. Pooki’s Mahi was launched by Silicon Valley technology executive Founder/CEO Leslie Magsalay-Zeller. Pooki’s Mahi owns the supply chain, sourcing the raw materials and global distribution channels. Pooki’s Mahi’s mission is to change current supply chains into a just-in-time (JIT) model by using technology and processes to launch specialty coffees or teas into the market in a sustainable, or recyclable capsule. Certificate of Insurance is required to resell Pooki’s Mahi 100% Kona coffee pods, or Matcha Matcha Man tea capsules. Customers partner with Pooki’s Mahi for the efficient supply chain, go to market launch and new product introduction expertise. Global retailers, professional sports teams, luxury hotel chains, and corporate kitchens sell Pooki’s Mahi®. Pooki’s Mahi performance-driven executive team are recognized with 150+ protected IP, 100+ exits, and 50+ awards in technology, operations, and supply chain. Pooki’s Mahi Kona coffee pods, Matcha Matcha Man® tea capsules, Kafpresso™ Kona coffee capsules has been a favorite of customers, charities, celebrities and athletes and have been featured at red carpet events including Celebrity Gift Suites, award shows, and seen on several television shows.